Question: Is pasta bad for you? Answer: Hell, no! Is it made fresh, with love, from four of the most basic kitchen staples and make you happy you’re alive? 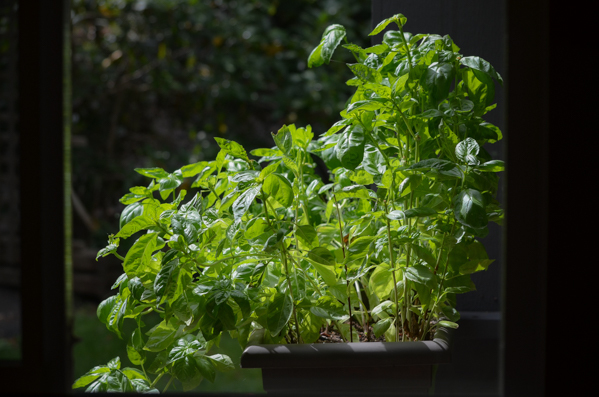 Does it inspire you to consume armfulls of verdant summer herbs at their height of greenliness and a glass of a good Italian red? Is it easy, cheap, delicious, and fun to make? Well. There you go, then. 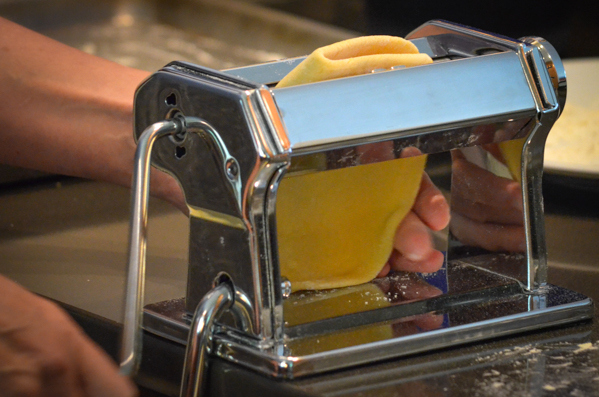 Even our Italian-made pasta machine knows that eaten in moderation, fresh pasta brings wellness into your life. 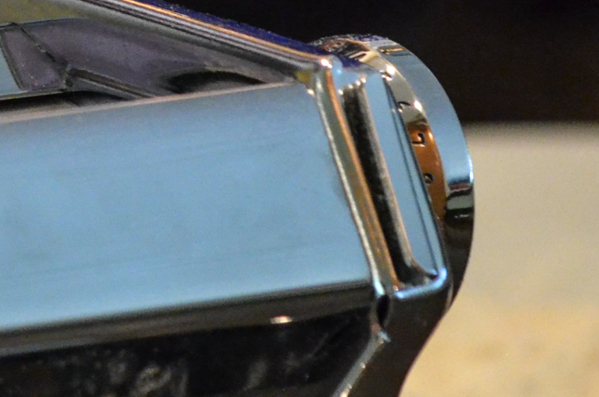 When we wanted to buy one a couple of years ago, we were left to our own sleuthing and landed on the Amazon favorite, the Marcato Atlas Wellness 150 pasta maker. 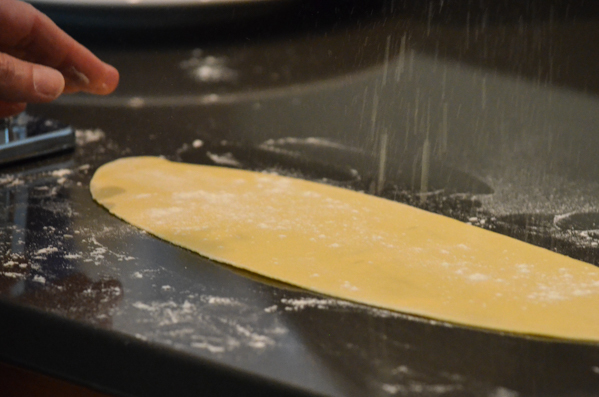 Simple, safe, and satisfying to use, the Marcato pasta roller and cutter brings one thing to the game that a rolling pin and knife combo never will: consistency. To qualify as comfort food, the noodles must be of a consistent thickness and width, bite after bite. 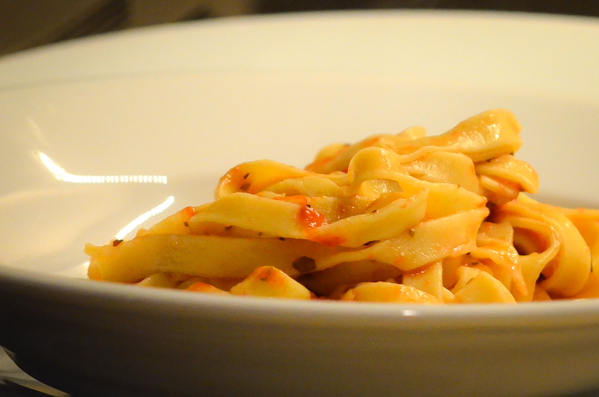 There’s something about the hypnotic bliss of excellent pasta that demands an unvarying mouthfeel. 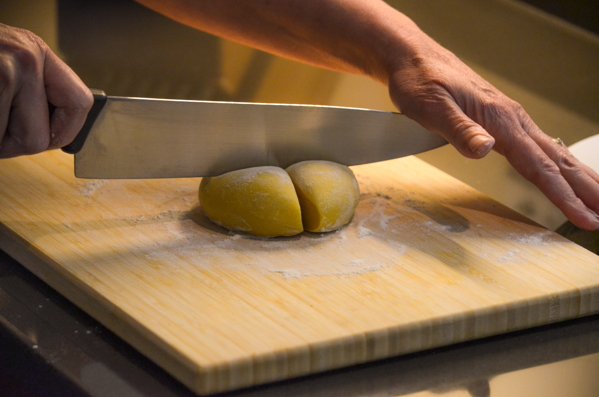 It’s why great restaurants care about evenly diced ingredients. Turns out, size really does matter. 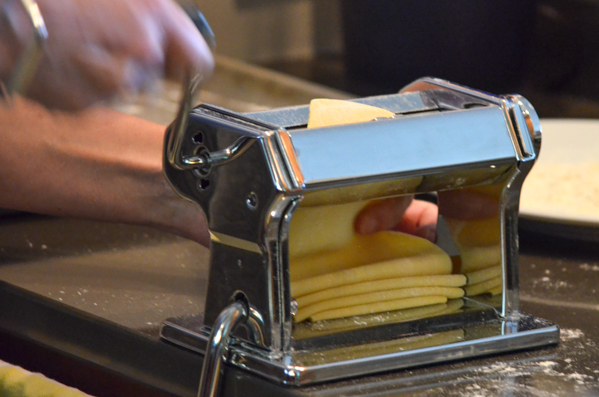 And for the home kitchen chef in search of consistency, sometimes machines are just better. In the case of manual pasta makers, almost 1000 Amazon reviewers rated the Marcato Atlas a whopping 4.7 stars of approval. If you’re more into the motorized kind of fun and have a KitchenAid stand mixer (and as a foodie’s kitchen “must have,” you should! ), there are pasta attachments that fit the power hub on your machine. The crew at Amazon love theirs: another 4.7 star recipient here across more than 800 purchasers. By the way, just because a Good Housekeeping article on cool retro-styled kitchen appliances includes a pasta machine, in this case the Roma Express Electric Pasta Machine , that doesn’t mean it’s actually cool. Cute, red, and vaguely reminiscent of Rosie, the maid on the Jetsons? You betcha! Finally, for those among us who prefer homemade fresh pasta only if it’s coupled with almost zero engagement, experience, or kitchen mess, Williams-Sonoma has high praise for the electric pasta machine by Philips, their all-in-one pasta whiz, and guess what? 4.7 stars on Amazon too. You put the weighed ingredients in the top, push the button, and… presto! 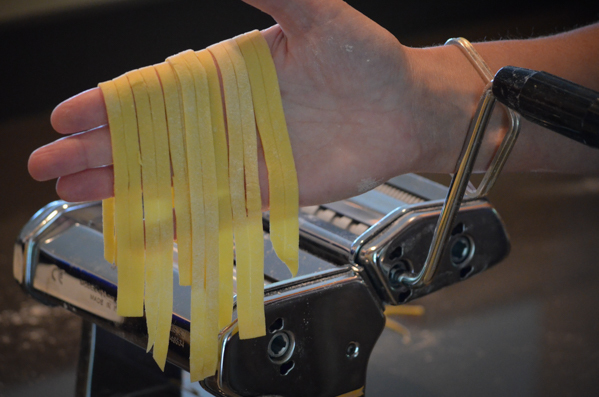 Like magic, the machine kneads, rests, and starts extruding pot-ready perfect pasta. 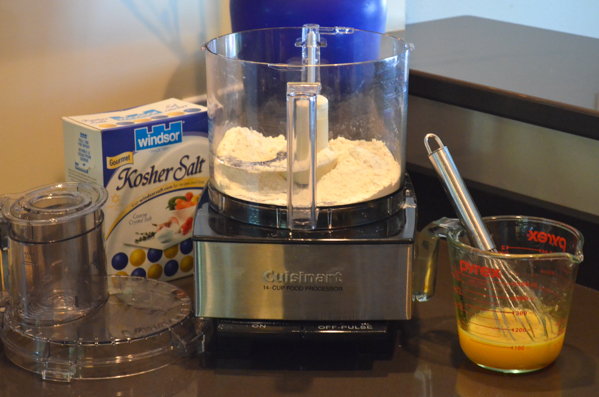 … our Cuisinart food processor. 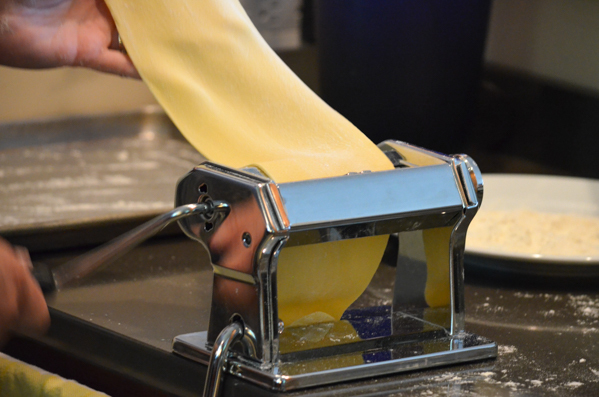 Whether you go with hand cut, manual roller and cutter, or all new-fangled electric, if you’ve got one of these babies in your kitchen, you are just moments away from fresh egg pasta dough. 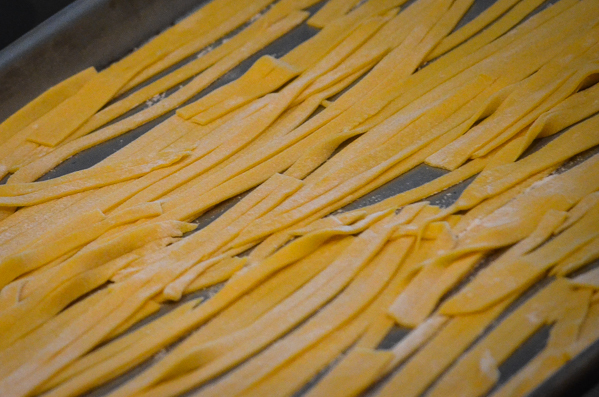 Watch how easy it is to make and cook pasta. 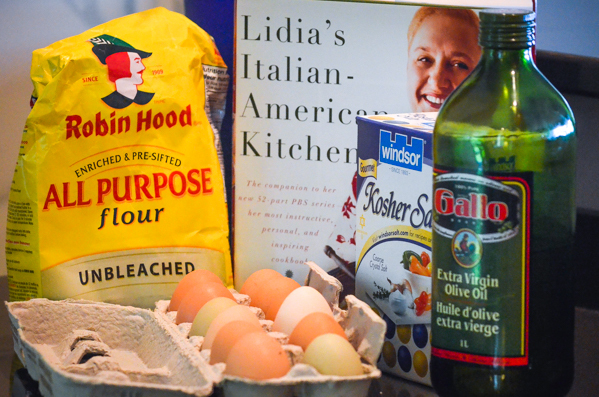 Lidia Bastianich, Queen of All Italian Cooking, lays out a helpful fresh pasta dough recipe on a per person basis: one egg per person, combined with between 1/2 and 2/3 cup flour (start with 1/2), 1/8 tsp. salt and 1/4 tsp. olive oil. 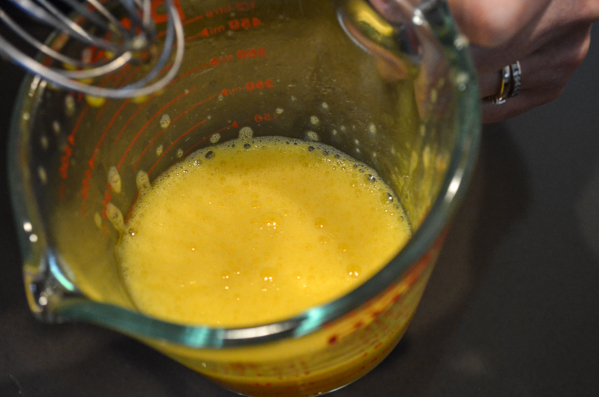 In a Pyrex 2-cup measuring cup, combine the eggs, salt, and oil, whipping them until they’re foamy. 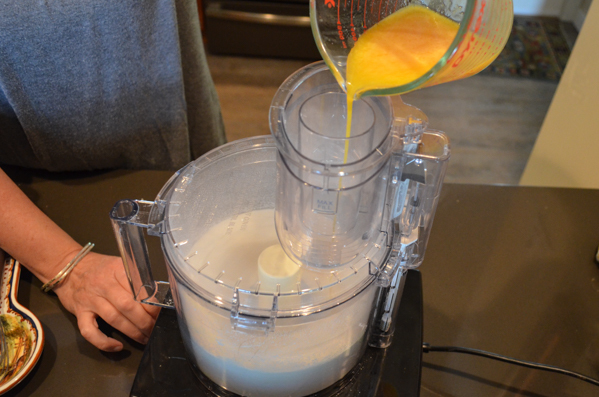 Put the flour in the Cuisinart with the metal blade, turn it on, then drizzle the egg/salt/oil mixture into the top. 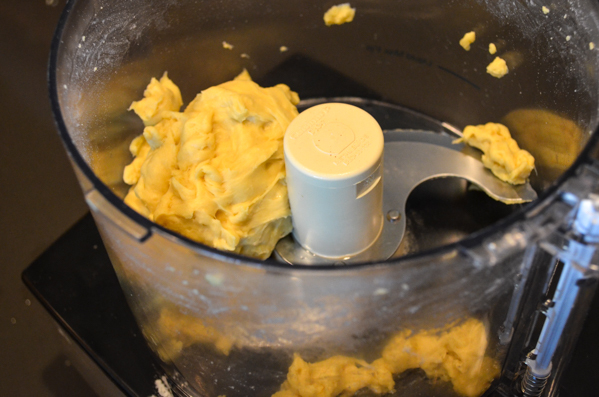 Run the Cuisinart until the dough forms into a rough ball, about 30-40 seconds. If the dough remains pebbly and refuses to collect into a ball, add just a dribble (seriously) of warm water, giving the processor a good chance to thoroughly incorporate the moisture before deciding it needs an additional dose. If the dough is sticking to the work bowl, add more flour, 1 tbsp. at a time, until the dough looks something like ours above. Don’t worry too much about over-processing the dough while you decide if the texture is right. It’s not that precious. 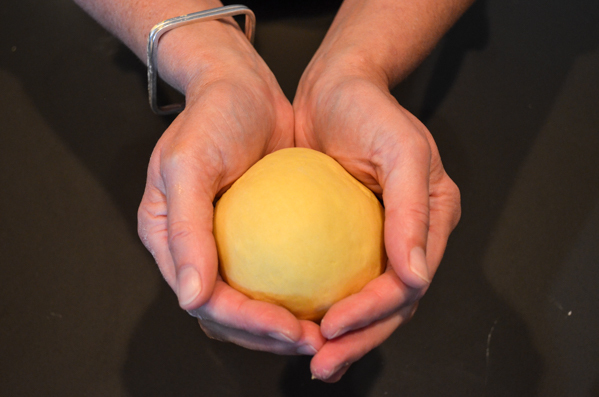 When you think you’re close, take the dough out of the processor and give it several good kneads with the heel of your hand, flipping and folding it on itself between pushes until you have a warm ball of silken wellness. 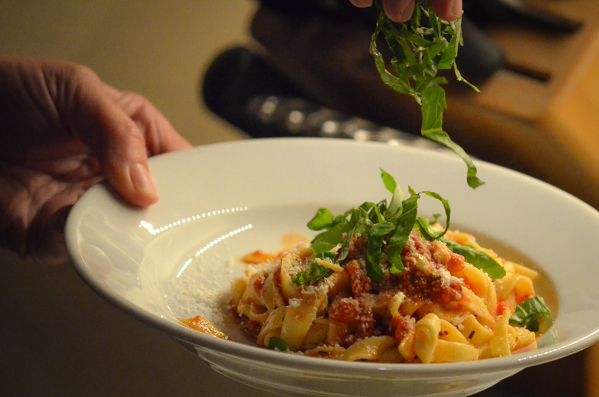 See why we prefer a little manual interaction with our pasta? Why should a machine have all the fun?! Give the gluten a time out to calm itself by fully encasing the dough with plastic wrap and letting it sit on the counter for an hour or so. 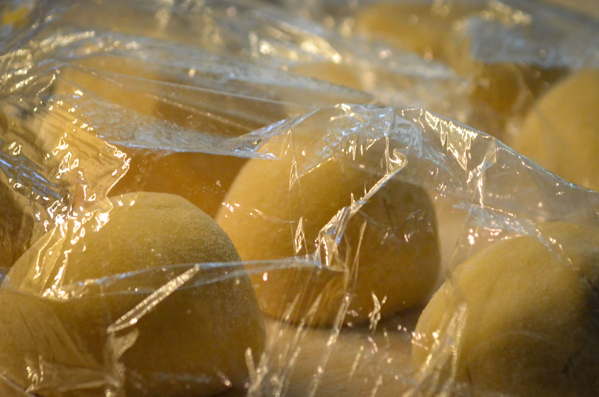 (This will keep you from fighting in the rolling/cutting stage with what Lidia calls “nervous dough.”) It can also sit in a fridge for a day, but be sure to let it warm to room temp before proceeding to the next step. Cut and hand roll the dough into two smaller balls per egg used. In our case, we ended up making two separate batches, four eggs in total, so we had eight smaller balls waiting to be processed. You’ll be working with one ball at a time, so keep the rest covered on a floured baking sheet while they wait their turn. Flatten the ball into an oval patty, set the thickness regulator to three, and crank it through. Fold it in half lengthwise and send ‘er through again. Change the setting to six, and roll again, or even a couple of times to get a consistent thickness across the whole sheet of dough. We’ve tried settings of five, six, and seven, and for the flat noodle, six seems to work best. 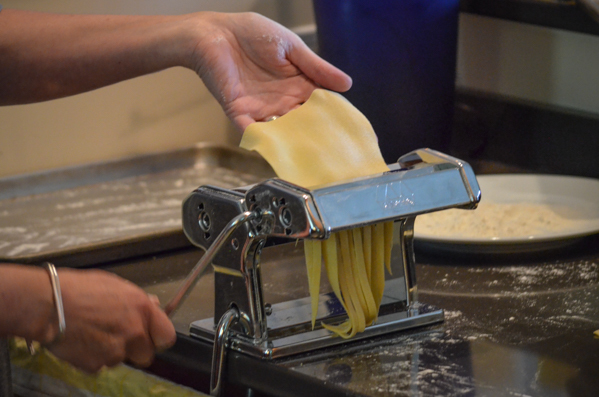 For spaghetti, you might want to go a little thicker and use a setting of five on the regulator. Attach the cutter device by sliding it into the brackets on the machine. Move the crank to the appropriate hole on the attachment, and feed in the rolled dough. For ease of laying out the noodles to dry, it can be helpful (and fun!) to have a buddy on hand to neatly catch and hold flat the noodles as they emerge. Even if you’re on your own, you can switch cranking hands and catch them yourself, or simply let them fall into a nest and dry them that way. They will separate just fine either way as they cook. We laid the flat noodles we were planning to eat in a few hours on a floured baking sheet in a (mostly) single layer to dry. For the spaghetti we were planning on eating later in the week, we took each batch as it emerged directly into the utility room and hung it on our freshly wiped laundry rack so it would dry completely before we stored it in ziplock bags. 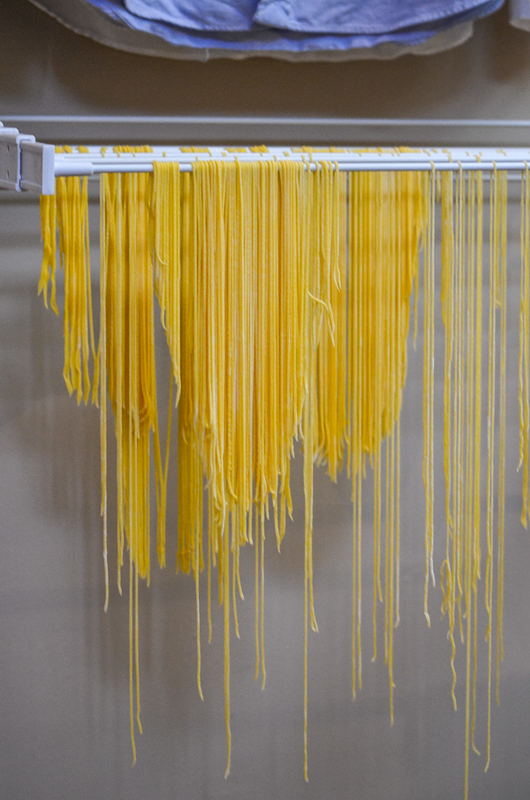 If you’re into making more than one batch at a time, you might want to invest in a nifty foldable drying rack, but so far, we haven’t felt like pasta for dinner on laundry day, so we’re good. 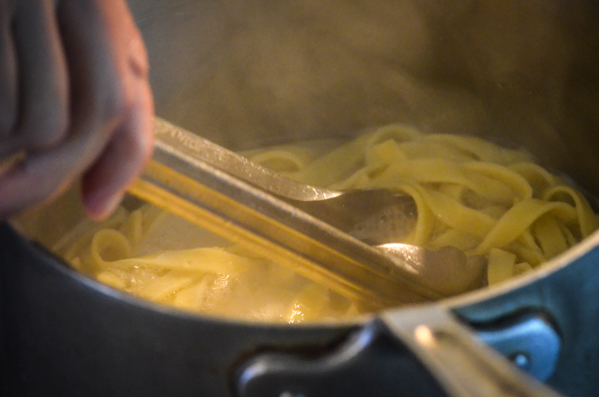 Bring a good-sized pot of water to a boil, add a pinch of salt and a dash of olive oil, drop your noodles in, and cook uncovered, stirring gently a couple or three times. For thinner, finer noodles, start testing (fish out a noodle and bite it) at 90-seconds. It’s okay if the pasta is still just a teensy bit firm as it will continue to absorb moisture and soften from the sauce. For thicker noodles, cook two minutes and begin testing until you like the feel of it between your teeth. Drain the noodles, reserving a few tablespoons of the water to add to the sauce to bring a beautiful gloss to the whole gig. Don’t rinse the noodles as it will prevent the sauce from adhering to them. 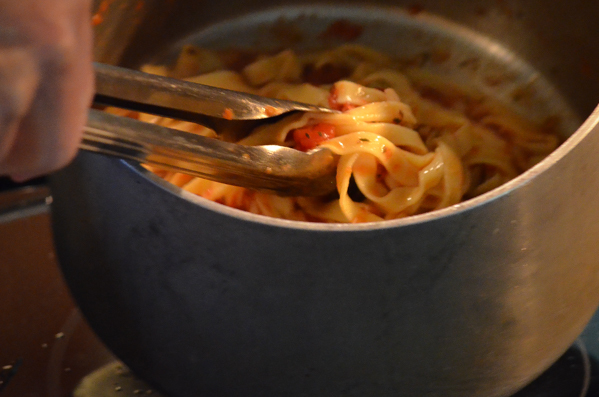 Return the hot noodles to the pot and gently fold in enough of your sauce to amply coat them. Using tongs, lift the noodles and twist them into a nest as you drop it into place to build a little height into the presentation. Top with a generous extra dollop of sauce and sprinkle with a little parmesan cheese if you’re so inclined. Our copy looks better than this. There are smears of egg-flour-and-water paste permanently lodged on Lidia’s beautiful Italian left cheekbone and chin, exactly as they would be in real life. Hi, found your site while looking for kitchen equipment reviews – thanks for a great resource! 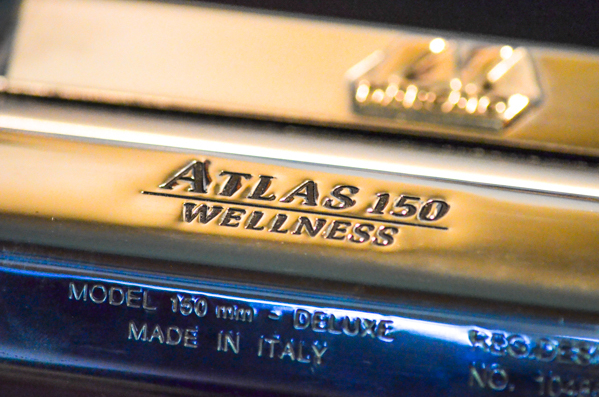 Our Atlas has given years of sterling service. We LOVE easy! Will give your version a spin (ha!) next time. I learned a lot & was entertained, as usual. It got saliva running! 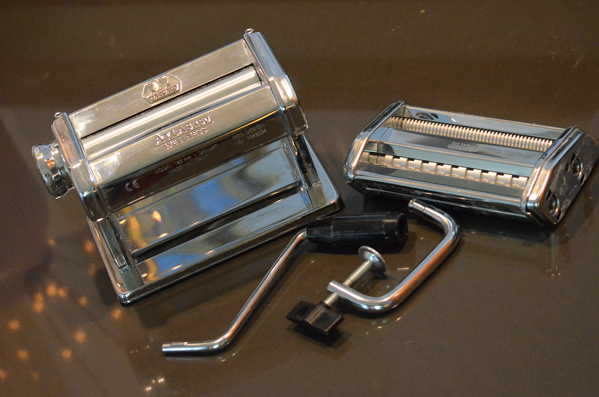 I have a Strauss Gourmet pasta maker; haven’t used it for quite a while. Looks quite a bit like yours; only I can’t remove the blade sections like yours. I don’t care much for the “shoe string” pasta. It breaks too easily. I know my dough is the right consistency.